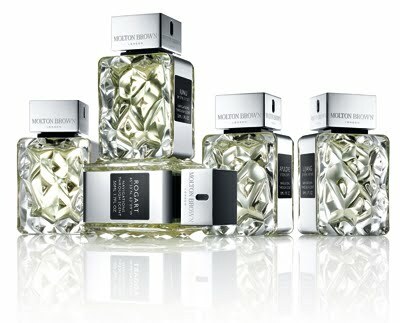 British toiletry giants Molton Brown have stepped up to the mark in 2011 and produced 5 brand new fragrances in a compelling "Navigations Through Scent" line. This series marks a natural evolution towards catering to the fine fragrance market for the first time in the company's 40 year history. "Navigations Through Scent" celebrates the origins and history of perfume and the importance of the rare ingredients used. Following some of the ancient and modern trade routes, Molton Brown's perfumer Jennifer Jambon spent over a year exploring each site, identifying the raw materials that best represent each location on the map. Egypt, China, Indonesia, England and Canada have all been referenced, with their longitudinal and latitudinal coordinates marked out cleverly on the bottle and box. Sorcery of Scent is pleased to briefly review each new fragrance from the line. Inspired by Egypt, Iunu is a voluptuous perfume which unifies bewitching oriental facets and enchanting spices. A dancing heart of Egyptian jasmine absolute and ylang ylang is afire with piquant black pepper, nutmeg, cinnamon and clove... the result an interesting play between pure innocence and unashamed carnality. A wonderful ribbon of incense and myrrh lends a weightless esoteric quality, whilst sandalwood and patchouli anchor it to the earth again. A perfume which is constantly evolving - twirling like a naked dancer - Iunu is an intricate scent of empowerment and carnal collusion. A Chinese love story told in hushed whispers, from behind cupped hands. Lijiang is a beautiful, diaphanous perfume that's as sheer and delicate as a fine paper lantern and has the stunning tactile quality of shot silk. Crisp white tea and Chinese osmanthus feature in this scent, which have been masterfully blended with shimmering bergamot and transparent white musk. Pink berries also provide a soft vermillion blush across Lijiang's milky white cheeks. Luminous, ceremonious and unostentatious, this perfume is as good as osmanthus and white tea gets! A true beauty. Indonesian patchouli is the protagonist of this perfume; a recital of olfactory chiaroscuro where the tropics are speckled with sun and shadows. Singosari is dewy - like a rain-soaked landscape drying swiftly under the equatorial sun. There is a slightly cool, 'minty' quality to the perfume furnished by the patchouli, and this is played off against a clean vetiver background. This perfume doesn't feel too far removed from Tom Ford's White Patchouli in its approach, but a faint huff of spice and incense takes it to another territory, adding a slightly darker layer. Singosari feels harmonious, sensual and warm. Fancy a tipple? Apuldre won't disappoint with its armoury of accords from gin juniper, to fermented grapes to absynthe! Perhaps it's no coincidence that Apuldre means 'Appletree' in old Saxon english, because Apuldre's striking green opening notes capture the feeling of rolling hills and open English countryside... it is grassy and sappy, but also boasts a floral / aromatic huff of lavender. In a sense, Apuldre feels both traditional and resolutely contemporary at the same time. A slight hint of cedar wood conjures images and impressions of a damp forest floor. A scent of contradictions, Rogart is both austere and embracing, frigid yet comforting. Taking its inspiration from Canada, Rogart has a lip-smacking maple syrup note at its core, evoking feelings of warmth and comfort. Obversely, elemi, coriander and juniper lend a chilled, "crisp-air" association, and the two qualities lock horns like a pair of mountain stags. The contrast is profound. Fir balsam and a whisper of smoke lends a feeling of familiarity and having "just stepped in from the cold" to a raging fire in the range. Rogart is a unique paradox between opposites with woody, slightly gourmand qualities. 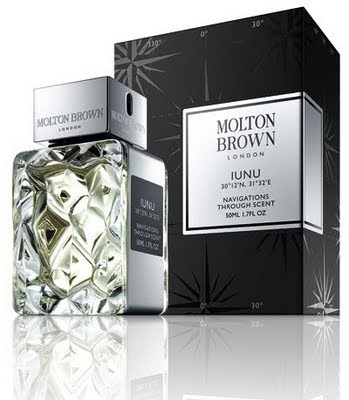 Interestingly, Molton Brown have chosen not to use a rigid perfume classification (EDC, EDT, EDP), for these scents, asserting instead that across this range their perfumes contain an average of 11.6% perfume concentrates. (Personally, I, the author, find most of these on par with a standard EDT or EDP). The Navigations Through Scent series launches in Harrods this month and widely in the UK from September.